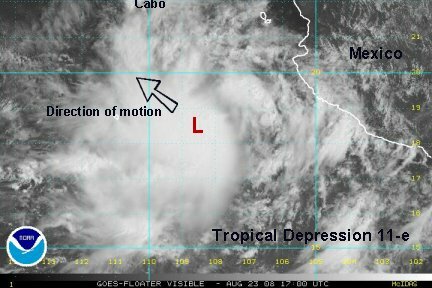 The tropical depression (11-E) is centered near 18.5 N / 108.5 W or about 310 miles south-southeast of Cabo San Lucas. The official NHC track takes this system up the west coast of Baja just offshore. The latest satellite imagery shows a farther west motion, so the track should be adjusted farther west off the coast. It's still possible for the Baja to get some gusty winds and rain, espectially southern Baja. We believe that this system is now tropical storm Julio and will be upgraded by NHC later today. NHC upgraded to tropical storm Julio during the last advisory. Deep convection is increasing around the core of Julio. Even though the center will move west of Cabo, it still should make landfall not far northwest on the southern Baja later this afternoon. Top sustained winds are 50 mph. Cabo will experience gusty winds and rain squalls with the more persistent wind and rain northwest of there. Last edited by Caribbean Traveler on Sun Aug 24, 2008 4:08 pm, edited 1 time in total. Julio's deep convection is starting to wane. 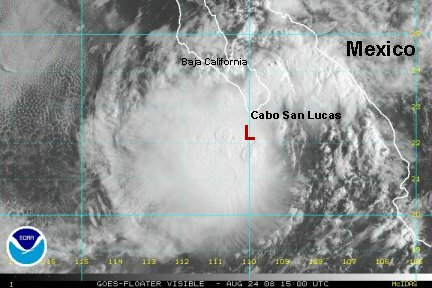 The circulation is just south of Cabo and sould make landfall later this evening northwest of Cabo San Lucas on the southern Baja. One can still expect gusty winds 40-50 mph with rain squalls. 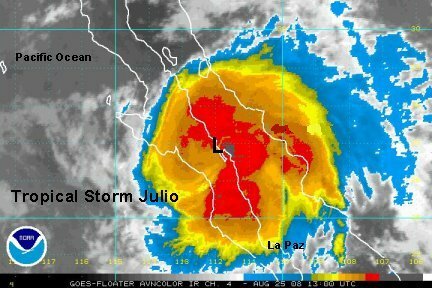 Julio made landfall a short while ago. Due to the lack of recon aircraft, or any land based reporting stations nearby, the exact landfall is just an estimate. The exact center is obscured underneath heavy showers and storms. 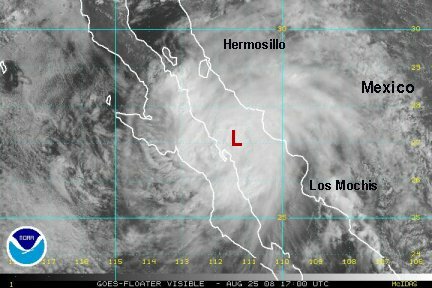 The landfall occured roughly half way between San Lucas and San Carlos on the southwestern Baja peninsula. The forecast calls for Julio to continue over land then move into the Gulf of California. Since the water temperatures are warm, it's possible that Julio will regain some strength or not weaken very fast. Heavy rain and wind gusts 40-50 mph will gradually subside this morning. 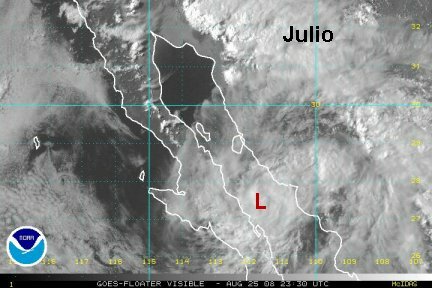 Julio is still over land bringing heavy rain and likely flash flooding over the central Baja. It will be moving into the Gulf of California shortly which may keep it from weakening or possibly even allow it to strengthen for a short while. Julio will continue northward, and possibly be affecting the southwest U.S. by enhancing the monsoon with heavy rainfall. Interests in northwest Mexico and the southwest U.S. should follow the progress of Julio for potential flash flooding rains. Julio is near the Gulf of California. Interests in northwest Mexico and the southwest U.S. should follow the progress of Julio for potential flash flooding rains. Last edited by Caribbean Traveler on Mon Aug 25, 2008 7:41 pm, edited 1 time in total. Julio is barely offshore in the Gulf of California off of the east coast of Baja. 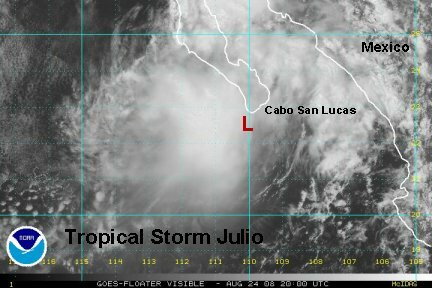 Interests in northwest Mexico and the southwest U.S. should follow the progress of Julio for potential flash flooding rains. 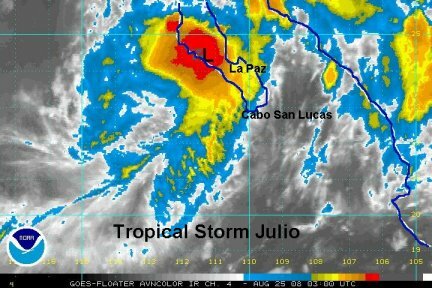 Julio is a tropical depression and is fading. It still will enhance rainfall in northwest Mexico and the southwest U.S. This is our last update on Julio.